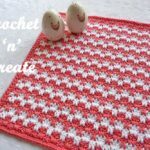 Free Crochet Pattern-Square Hot Pad – Keep your dining table free from stains and burn marks with this double thick hot pad, great for vegetable dishes etc. 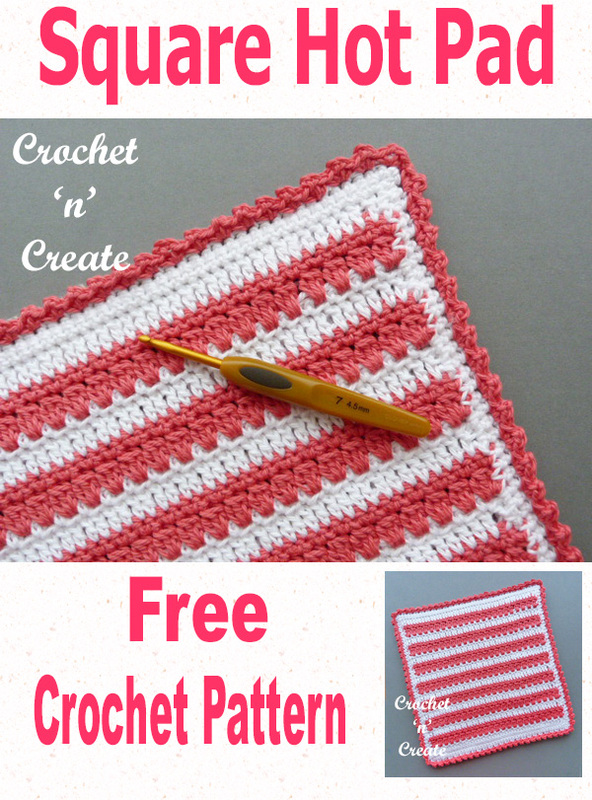 See my free Round Hot Pad pattern. 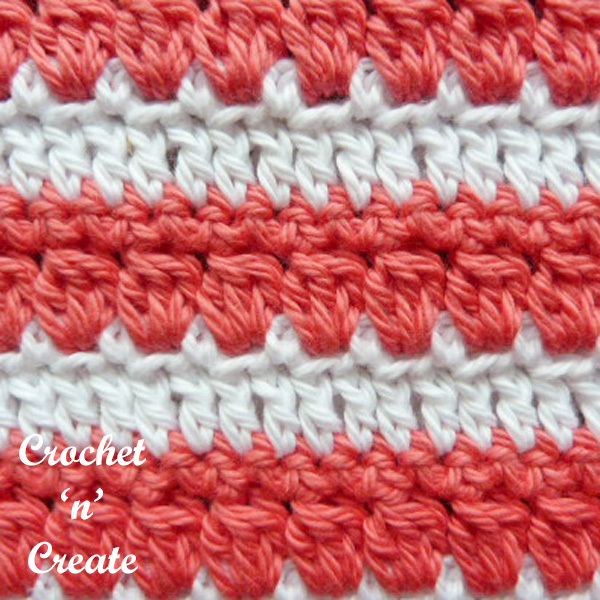 The sample was made in King Cole Cottonsoft DK yarn in colors Coral and White. Make in colours to match the season. See more of my kitchen patterns. dc3tog. Leaving last loop of each dc on hook work 3dc in next stitch, yo and pull through 4 loops. Make 2 pieces the same, weaving in loose ends as you go. Fasten off. Join in color 2. Fasten off. Join in color 1. Rpt 2nd to 5th Row six more times, until seven dc3tog rows have been worked or work measures approx 10.5 inches. Next Row – ch1, 1sc in base of ch1, 1sc in each dc to end, 1sc in top of ch3, work 43sc evenly in row ends down first side of pad, 3sc in corner, 1sc in each ch along starting ch edge, 3sc in corner, 43sc evenly in row ends up second side of pad, 1sc in corner, sl st to first sc on beginning of row. Edging & Sealing Both Sides Together – With RS facing, place WS of both pieces together, using color 1 and working through back and front of both pieces, ch1, 1sc in base of ch1, 1sc in each sc around hot pad to end, working 3sc in corners, sl st to first sc on the beginning of row. Turn. Next Row – ch1, (1sc, 2ch, 1sc) in base of ch1, * skip 1sc, (1sc, 2ch, 1sc) in next sc, * rpt from * to * around pad to last sc, skip sc, sl st to first sc on beginning of row. 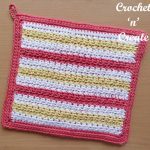 The written instructions and pictures for this free crochet pattern-square hot pad are copyrighted to crochet ‘n’ create © 2018. 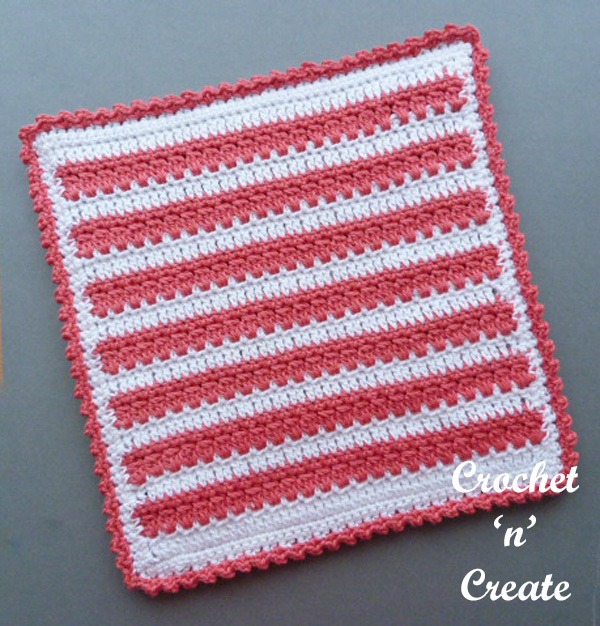 You are welcome to sell the finished products made from the free crochet pattern-square hot pad, I just ask that you please use your own pictures and put a link back to crochet ‘n’ create. 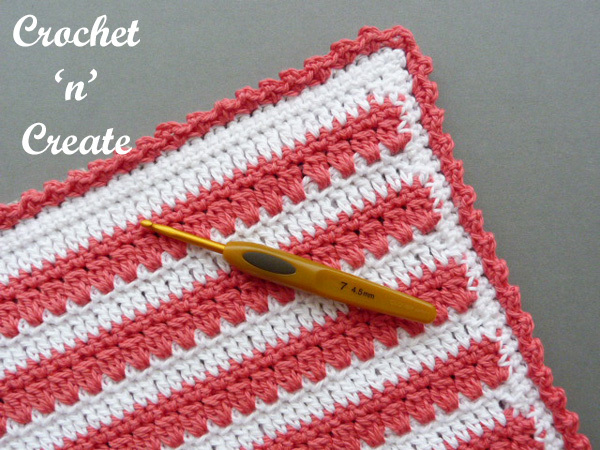 DO NOT share the written instructions for this free crochet pattern-square hot pad. 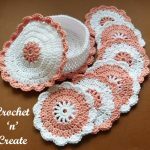 This entry was posted in crochet for the home, crochet for the kitchen, Crochet Hot Pads and tagged crochet, crochet for home, crochet for Kitchen, crochet hot pad on 6th October 2018 by crochetncreate.